Stocks are closing slightly lower on Wall Street after a mid-afternoon rally faded away. The modest declines Thursday came after three days of gains, including the market's biggest jump in eight months on Wednesday. Technology companies and banks had the biggest declines, offsetting gains in health care and other sectors. Bank of America fell 1.4 percent and Intel gave up 2.4 percent. Deutsche Bank sank 4.8 percent after Germany authorities searched its headquarters on suspicion that employees helped clients launder money. The S&P 500 fell 5 points, or 0.2 percent, to 2,737. The Dow Jones Industrial Average lost 27 points, or 0.1 percent, to 25,338. The Nasdaq fell 18 points, or 0.3 percent, to 7,273. Bond prices rose. The yield on the 10-year Treasury fell to 3.03 percent. Banks and technology companies are leading stock indexes lower on Wall Street following huge gains a day earlier. Bank of America fell 1.4 percent Thursday and Intel gave up 1.7 percent. The declines came a day after the biggest rally in eight months. Deutsche Bank sank 5 percent after Germany authorities searched its headquarters on suspicion that employees helped clients launder money. The S&P 500 fell 9 points, or 0.3 percent, to 2,733. The Dow Jones Industrial Average lost 87 points, or 0.3 percent, to 25,278. The Nasdaq fell 26 points, or 0.4 percent, to 7,263. The price of oil traded below $50 a barrel overnight but was up 3 percent at $51.75 in New York. Banks and technology companies are leading stock indexes slightly lower in early trading on Wall Street. Bank of America fell 1 percent in the first few minutes of trading Thursday and Intel gave up 1.4 percent. The early declines came a day after the market's biggest rally in eight months. Deutsche Bank sank 3.3 percent after Germany authorities searched the bank's headquarters on suspicions bank employees helped clients launder money. The S&P 500 index fell 6 points, or 0.2 percent, to 2,737. 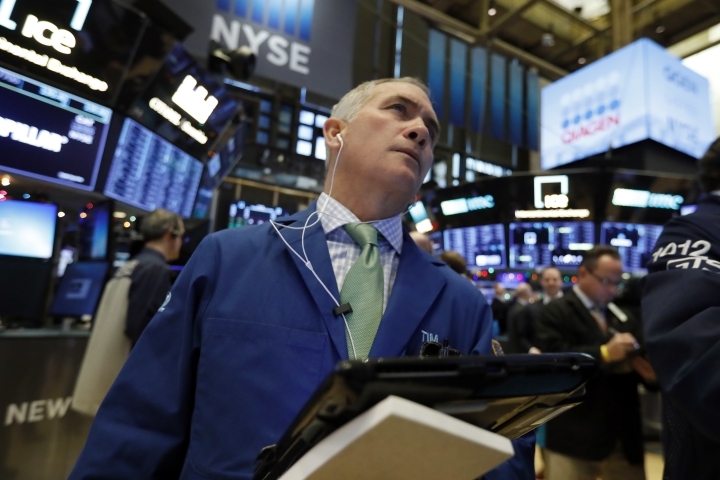 The Dow Jones Industrial Average lost 38 points, or 0.1 percent, to 25,328. The Nasdaq composite fell 14 points, or 0.2 percent, to 7,277. Bond prices rose. The yield on the 10-year Treasury note fell to 3.03 percent.